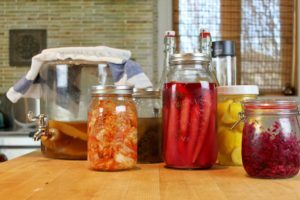 A quick and wild ferment- no cultures required! Pineapple- the fruit is great, but don’t toss the peel! I love pineapple, and enjoy it year-round, adding it to milk kefir smoothies for extra sweetness, and my kids enjoy it as a sweet snack. There are so many uses for this tropical fruit-from baked goods, to grilling it on the BBQ, and adding it to fresh salsas for an extra dimension of flavour. 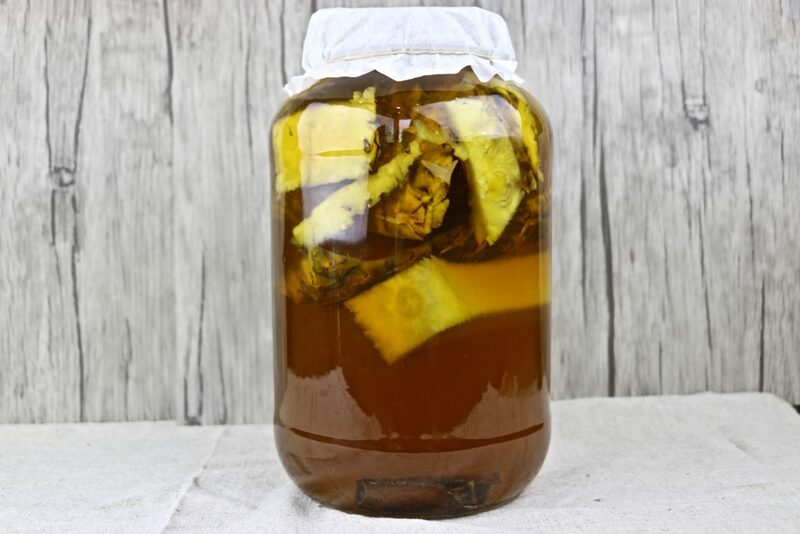 But the possibilities don’t end with the fruit -before you toss the pineapple peel and core in your compost bin, try making the fermented beverage, tepache, instead. 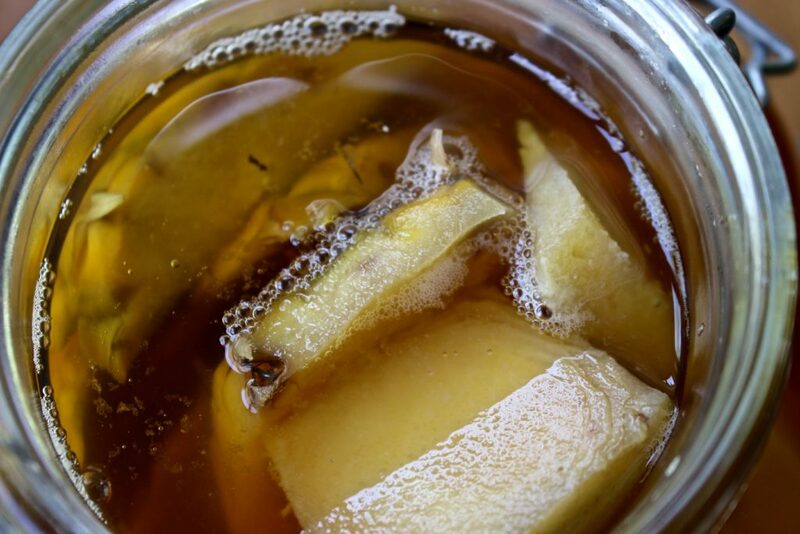 It’s easy to make, a great alternative to kombucha, and doesn’t require any cultures to get it started. 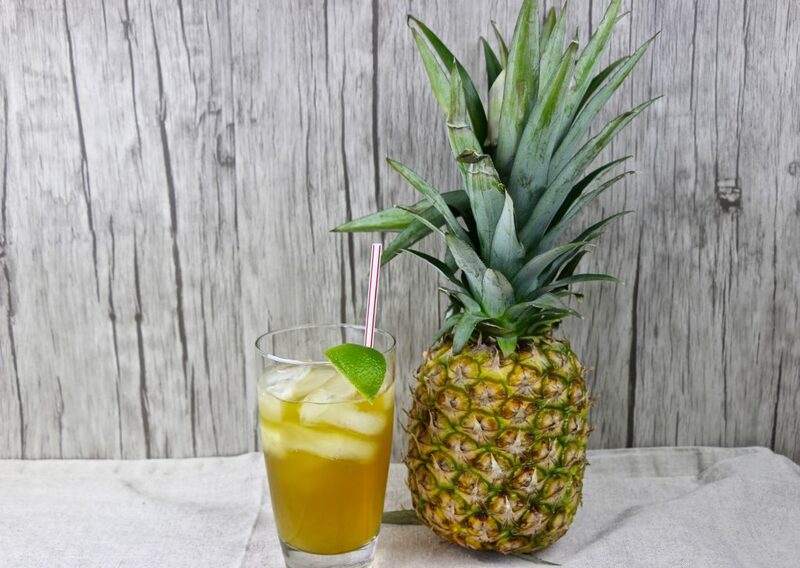 Tepache is a fermented pineapple drink popular in Mexico. Slightly effervescent, tepache is refreshing and cider-like with a sweet pineapple aftertaste. It is made using water, sugar and pineapple (whole or just the rind). 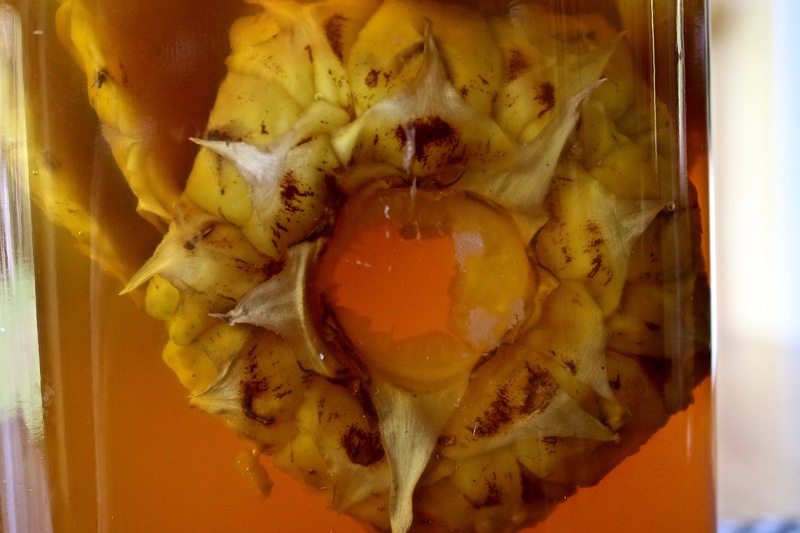 Tepache is a wild ferment- the yeast and bacteria naturally present on the pineapple are responsible for the fermentation process so no additional cultures are needed. It is also a quick ferment (4 days maximum- any longer and it will turn to vinegar). 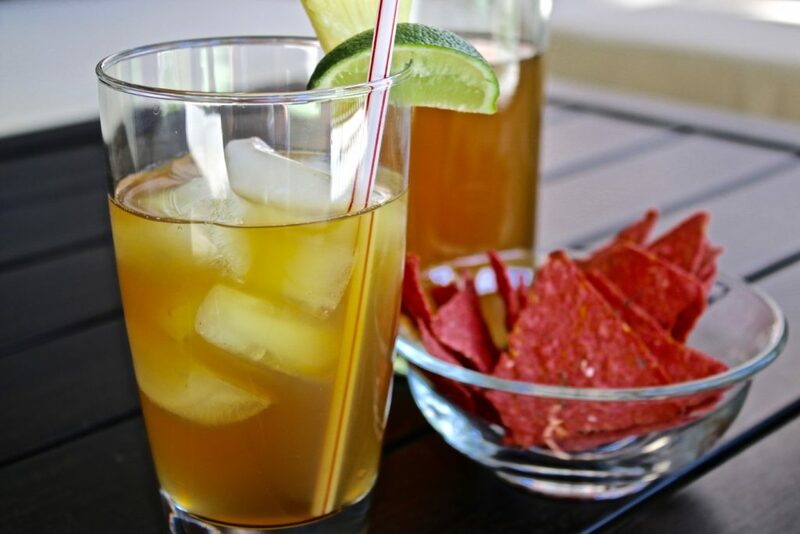 Tepache is best served very cold, and has become a popular ingredient for cocktails (with rum, tequila, mexican beer…). Try it today, and you’ll want to keep a bottle in the fridge for a refreshing treat on hot summer days! Remove peel, leaving a little extra fruit on the peel. Cut out core. Reserve fruit to eat later. Dissolve sugar in water. Add pineapple peels and core and add more water if necessary to fully cover. Use a fermentation weight to keep peels and core submerged under the sugar water. Cover the top of the jar with a coffee filter or clean cloth. Leave at room temperature for 3-4 days. It will become cloudy and develop a harmless white foam that can be skimmed off. Strain finished tepache into bottles and refrigerate. It will smell a little musty, but the taste will not be strong. For extra fizz, do a second fermentation (closed bottle) for an extra day or 2. Tepache is best served cold. Cheers! I am making two bottles today and going to let one turn into vinegar, I chose piloncillo for my sugar because for Tepache that is the tradition. I was thinking if the harmless white foam is not skimmed off would that be the start of “Mother” pineapple vinegar? Thanks, Lot’s of good healthy fun. Hi Licha- thanks for your interest and question. I also like to use piloncillo when I make tepache and am lucky that I am able to find it in my city, but other sugars work as well. In theory, the white foam that you skim off the top could be used as a starter since it contains the microbes also found in the tepache. Good luck! Hi Miguel- thanks for the information, I’ll have to check it out! I believe if you left tepache to over-ferment, it would have the same effect! Hi Jody! For the second fermentation, should I keep the bottles of strained liquid in the fridge or out at room temp? Thanks! Hi Lucia- for a second fermentation, you would leave the bottles at room temperature. I only do it for 2 days maximum to keep the alcohol level low. could you add other fruits with the pineapple like mango or blueberry while its fermenting?? 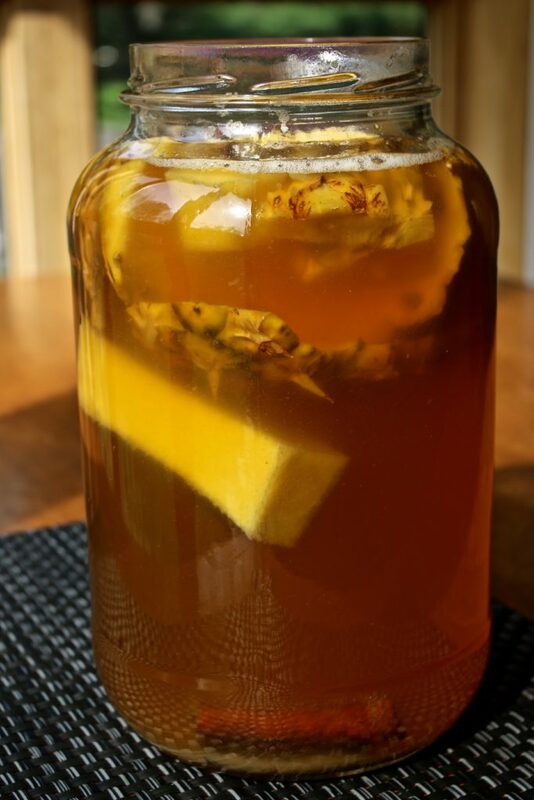 Hi Jason- traditional tepache recipes use only the pineapple and add spices (like cinnamon) for extra flavouring. I haven’t seen any using an additional fruit, but it could produce interesting flavours. I would suggest that mango would pair well with pineapple. Let me know how it turns out! Hi Connie- Tepache is not traditionally made with honey, but with a raw form of sugar (pilocillo, basically a raw cane sugar). I usually use pilocillo, sucanet, and even grocery store brown sugar. Honey contains glucose and the antibacterial properties will be diluted once it is mixed in the water/ pineapple solution, so, why not? Let me know how it turns out! Hi Margosa- thanks for your question. I try to buy organic pineapple at local health food stores, but will also use pineapple from local grocery stores. I always wash them (for pesticides and for any other “residue”). In the end, it’s a personal choice regarding one’s view on organic produce. In regards to tepache fermentation, from my experience, grocery store pineapples ferment equally as well as organic pineapple. This looks delicious! I am making it today.